Whether you�re a student who brings home-packed lunches to school or you�re working at a job most days of the week, these insulated lunch boxes are perfect for those days when you get tired of school lunches or eating out. Save time and money when you use these lunch totes to bring healthy homemade meals wherever you are! Our collection of cool lunch bags feature beautiful or cute Asian designs that you are sure to fall in love with. 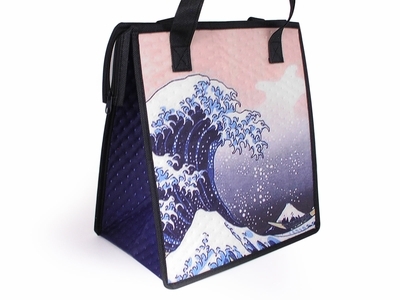 Whether your lunch bag has the famous Hokusai �The Great Wave of Kanegawa� printed on it, a stunning cherry blossom motif, or a cute maneki neko design, you�ll find that these insulated lunch bags are both functional and eye-catching. Made from a light fabric, these Asian lunch bags have a completely insulated silver interior to ensure that your lunch will stay cool or warm. Each lunch bag comes with a zipper on top to ensure that your food isn�t exposed to room temperature until lunchtime. The two handles on each bag help you to easily take your oriental lunch bag on the go. These reusable eco bags are great to bring to picnics or parties and will surely be a great conversation starter! Offered at these unbeatable prices, get a great deal on these wonderful insulated lunch bags today!